All is going well with the proposed Birkbeck course, which starts later this month and will provide participants with practical experience of writing up archaeological excavations — the work done by Ted Sammes at Church Terrace, Hendon, as part of his ambition to identify Saxon Hendon. The lead tutor will be Jacqui Pearce, of MoLSS (Museum of London Specialist Services — not MAAS) where she is their expert on Post Roman ceramics. She lives in Hendon. We could not ask for better qualifications! She will be supported by Kim Stabler of Pre-Construct Archaeology, who will deal with the stratigraphic side, while Louise Rayner and Roberta Tomber, both of MoLSS, will also be involved as occasional lecturers. For full details, see the leaflet which is enclosed with this Newsletter. Do apply soon if you want to join the course. At its last meeting your committee recognised that it was not making best use of the interests and skills of the society's members, and it wishes to correct this. A questionnaire is therefore enclosed. Please give it your most earnest consideration. No capacity is too small, every little will help and all contributions will be grate­fully received! Please fill it in and send it off. Now! Audree Price-Davies' review of the HADAS visit to Canterbury Cathedral was a fascinating reminder of having to sum up in a single sentence great events in history. It also reveals, I suspect, the author's interpre­tation of such events. Let me say right away that it is not a question of a right or wrong view or the choice of word and phrase. For example, "Thomas Beckett... was zealous in defence of the church... He criticised Henry II's judicial reforms..." So he did, but we tend to be weaned at school on the colourful story of Beckett's murder, at the expense of the importance of Henry's attempted reform of the courts of law, the wiping out of feudal warring and the promotion of a jury system to evaluate the truth in judicial disputes. More particularly, the king was insist­ent that the church and its cohorts (who were by tradi­tion immune from civil trial and punished far less se­verely) should be judged, and punished, in a similar way to the laity. Henry VIII, bless him, is always a good topic for discussion. Here again, yes, he lusted after Ann Boleyn, which is always good copy. But his quarrel with Rome was about a divorce from Catherine of Aragon and, in the context of the times, the claims he made to have the marriage annulled had some validity. He certainly thought so and he was, contrary to popular belief, a deeply religious man. Finally, the beheading of statues and breaking of windows by the Parliamentary soldiers. Today, we can hardly conceive the importance of religion at that time. Such statues and finery were redolent of an authoritar­ian church so hated by much of the army who had fought long and hard for what they saw as religious freedom. Coupled with a religious commandment about not wor­shipping graven images, they gloried in what they saw as destroying the work of the devil. I suppose all of this can be summed up in Audree' s phrase "... they objected to the power of the church over the people...", but that seems to underplay the reasons for the vandalism. With that said, I enjoyed reading all the reviews and was positively salivating at the thought of those cakes and nice hot freshly-brewed tea. Another of the great glories of England! One of the perks of editing the HADAS Newsletter (or contributing to it, for that matter) is to be allowed to tell everyone about your summer holiday (or rather, this time, an early spring one). We went to Sardinia, continuing our Mediterranean island hopping which has already included Corsica and Sicily — both strongly recommended, not only for archaeological reasons. Sardinia's unique contribution to the archaeological record is the im­pressive defensive architecture of its argumentative Bronze Age tribes. Nuraghi are circular towers, built of massive stone blocks, each one the central point of a settlement of round huts. The fashion for them continued from around 1800 to 500BC. The oldest, simplest nuraghi are a single tower; as centuries passed the design became more complex. Several machiolated towers, linked by a broad rampart, circle a single taller keep, double-walled and multi-storied, with a staircase spiralling up inside. In one of the largest of the settlements, Palmavera, is another much bigger but still circular space, outside the central fortress and beside the small round living huts. It is interpreted as a meeting place, and at its centre was found a contemporary model of a nuraghe, proof of the original architec­ture of now partially-tumbled remains. An even more astonishing example of the geometric building skill of these quarrelsome tribes is angular rather than circular, however. At the sacred spring of Santa Cristina they built, in precisely-squared masonry, a trapezoidal entrance and descending flight of steps which would be a tribute to the ability of any modern builder. The people who the 7,000-plus nuraghi protected continued the circular theme in pottery as well as buildings. Among surviving examples are large, flat discs, which even serious-minded excavators suggest just might be the original pizza platters... They also shared another continuing Sardinian taste, for clams, as the leftovers stuck on a 3,000-year-old dish prove. And they made fine stylised bronze figurines which indicate what they wore, which weapons they used and implying they were a tall, thin race. This summer was due to see the completion of major building work at the Museum of London's Eagle Wharf Road resource centre and the turning of the museum into a two-site institution. Not only will the extensive building work provide a home for LAARC (the London Archaeological Archive and Research Centre), but there will also be new offices for the Museum of London Archaeology Service (MoLAS), which has just moved from Walker House, its current base in the City. The team of archaeological finds and environmental specialists (the museum's Specialist Services, MoLSS) are already based at EWR, as are the reserve social and working history collections. For the first time all the museum's staff, activities and collections will be in just two buildings, London Wall and Eagle Wharf Road. To mark the occasion the latter has been re-named Mortimer Wheeler House to recognise the links between perhaps the best-known 20th century archaeologist and the Mu­seum of London. The creation of LAARC has received funding sup­port from the Heritage Lottery Fund, Getty Foundation, Government and from many local societies, including HADAS (whose name will be inscribed on the funders' wall), institutions and individuals. It has created the space properly to store and curate all the archaeological finds from past, present and future London excavations. Mortimer Wheeler House and LAARC will become the place in London for anyone with more than a passing interest in London archaeology. Researchers, students, local society members, school parties and indeed any­one will be able to make an appointment to come and consult the archaeological archive— the finds and records from over 4,000 London excavations. The archaeological archive team is working hard to ensure the centre caters for the needs of all who might want to use it and this will include evening and weekend opening. The whole ethos of the building is accessibility, with as much material as possible on open display. The presence of MoLAS, LAARC and MoLSS in the same bu ilding should also lead to some exciting research collaborations. It is also hoped that the close proximity of the archaeological and social history collections will lead to research across traditional periods and subjects. With much talk of regionalisation and centres of excel­lence in the museum world, Eagle Wharf Road will hopefully act as a model for others elsewhere to follow. LA ARC will be open to the public between 9am and 9pm every weekday, and between 10am and 4pm on the first and third Saturdays every month. However, this will always be by prior appointment only. Stuart Waller which helped fund the LAARC project) and the Society Room. The Visitor Centre, on the ground floor by the entrance, can take up to 100 people and is hilly equipped to act as a seminar or lecture room. The Waller and Society Rooms are on the first floor near the archive. Each will take about 20 people. All these rooms will be available with prior booking during opening hours. Other open areas will be available for individual researchers in the actual archive storage areas. The entire archaeological archive will be available for study, including finds, photographs, records, re­ports, plans, etc. This will be available both physically and wherever possible electronically. A computer index and access system is being developed to further facilitate use. It will also be possible to consult reference collec­tions, and indeed staff. There are no plans to charge for the use of any facilities but we will monitor this, and will deal with exceptional items on an individual basis. The archive team, currently five staff, will be there to help researchers. There will also be different guidelines and manuals on how to use the archive, and a computer access system. However, we fully appreciate the need to provide personal support to users. We would welcome voluntary help from either indi­viduals or groups from local societies to undertake the many collections management projects that are planned. Indeed it is hoped that over time local societies might have their own projects, both collections management and research based, at LA ARC. For further information about LAARC and how it can be used contact the Archaeological Archive Manager John Shepherd on 020 7566 9317. The outing to Cranborne Chase and Wilton House on July 14 started well, in spite of the pessimistic weather forecast. After driving through showers we arrived at the market town of Stockbridge to have coffee and biscuits at the Grosvenor Hotel, an old coaching inn. The wide High Street was busy, with local people doing their shopping and visitors enjoying the cafes, the pretty cottages and shops. There was a craft fair being held in the town hall, which was a tempting attraction for some HADAS members. The buildings in the High Street are constructed on an old causeway of chalk and bundles of withies over the marshy valley of the River Test, which can be seen as you leave the town. There are small ponds at the sides of the High Street where some mallards were taking the opportunity to enjoy the periods of sun­shine and the attention of passers by. Stockbridge has a long history. The Lordship of the Manor can be traced back to 1066 and the Courts Leet and Baron, which also date back to the Norman Conquest, continue to be held early March. There are many reminders of Stockbridge's period as a "rotten borough" (1563-1832). The town hall, built in 1790, was an election bribe, paid for by the two MPs. The magnificent silver mace of one of the three officers of the courts was also presented by an MP, in 1681, as was the church communion plate, in 1697-1700. There are two interesting churches, both named St Peter's. Old St Peter's was built in the 12th century, although parts of the chancel date back to a much earlier West Saxon chapel. In 1866 the new church, St Peter's Parish Church, was built in the High Street and the people of the town turned out with barrows to move some items from the old church to the new one, before demolition of the former began. Thse included a 12th century stone crucifix, a 13th century Purbeck stone font and 14th century window frames. Demolition of the old church began, but the chancel resisted all attempts to destroy it. After falling into disrepair, it was renovated in 1963 and in 1990 a major restoration began. Items restored, mainly by local experts, include an oak door of 1354, wall murals, 18th century commandment boards and a royal coat of arms dated 1726. There is a mass clock c.1240 on the jamb of the west door and in the east wall there are two rare white glass windows with 14th century grisaille work. With so much to see, our "coffee-stop" in Stock­bridge passed all too quickly and soon we were on the coach, wending our way to Sixpenny Handley. Following his army career, General Pitt-Rivers inher­ited large family estates, and was able to begin excava­tion and field survey of Cranborne Chase. His scientific approach, as well as the publication of his work in the late 19th century was so good, so far in advance of his time, that he has become known as the "father of modern archaeology". The present owner of Down Farm, Martin Green, has continued these excavations and revealed henges, barrows, pits and postholes. There has been no excava­tion this year, but we were rewarded by a walk to the natural shaft which he has explored to a depth of 13.2 metres during the last eight years. It was amazing to see how deep this shaft was, as we were able to stand on an inspection platform erected over it. Martin Green had been alerted to its presence by noting a crop mark when walking the fields with his dog. Excavation revealed beaker pottery, late Neolithic, early Neolithic and Mesolithic levels in the upper 1.5 metres of the shaft. Below this there is a much deeper area in which charcoal and some animal bones, includ­ing two complete roe deer skeletons, were discovered. From the various levels, 17 radio-carbon dates were established, which produced an unbroken sequence from about 4500-2000BC. The beginnings of human activity in the Neolithic period were dated to 3990­37805C. There remains the question of how this shaft devel­oped. Martin Green spoke of "underground caverns" known within the chalk, and said it seemed likely that this shaft resulted from the collapse of such a cavern. Perhaps, he thought, there might have been a stream running in the bottom which a later Mesolithic commu­nity could have regarded as a sacred place. Before starting back to the farm, Martin Green pointed out a long barrow on a hill in the distance, further evidence of neolithic settlement in the area. The hen house museum (from which the hens were ousted in 1970) is full of artefacts from probably all the various excavations carried out in the 20th century near Down Farm. The exhibits include two deer skulls, over 400 beaker sherds, and a grooved ware group which produced an extraordinary splayed flint axe, to mention just a few. There were Roman coins dating from Hadrian (117-138AD) to Constantine (307-337AD) followed by others until about 378AD. There were more of the later coins at a lower value, illustrating the debasing of the coinage later in the Roman Empire. Also in the museum was a local history section including an impressive display illustrating the last blacksmith in the area. The weather was much improved when we arrived at Wilton House, a little before 3pm. Our visit began in the riding school, now an exhibition centre, followed by Noblesse Oblige, a short film on the history of the house, narrated by a nun claiming connection with the earlier Benedictine abbey but bearing an uncanny resemblance to Anna Massey. In 1544 Henry VIII gave the abbey to Sir William Herbert, brother-in-law of Catherine Parr, who demolished it to build a house worthy of his rising status. Several years later Edward VI elevated him to Earl of Pembroke. 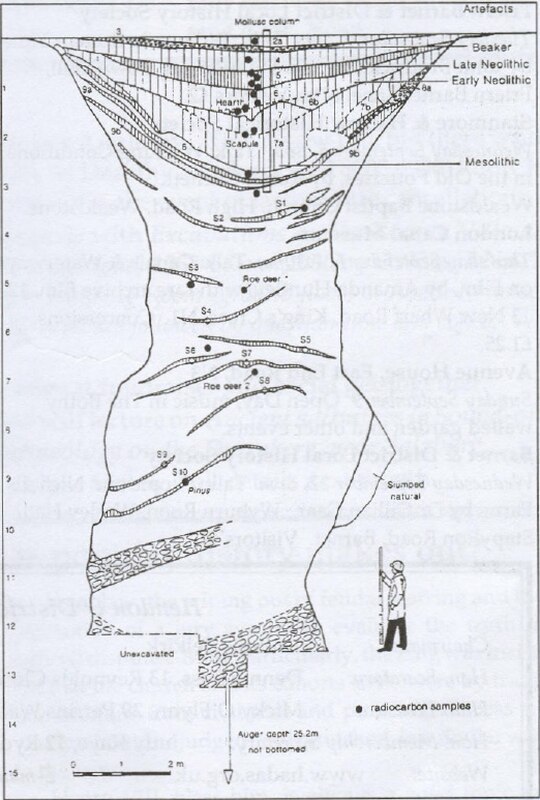 Down Farm: Excavating the henge monument at Wyke Down, possibly part of a major grooved ware settlement, in 1996, above, and, below, section through the great shaft. Drawing Wessex Archaeology, both illustrations courtesy of Current Archaeology (read more in issue 169). Leaving the film theatre we found ourselves in the Tudor kitchens where modelled cooks were prepar­ing a banquet. We had by this time acquired a "Wilton House Script for a Tudor Kitchen" to heighten our visual appreciation of the scene: "A place of great heat, noise, smells, confusion and curses... joints turn on spits operated by a boy... rats and mice scuttle away from sleek, ever-watchful cats, which cockroaches abound...". But all is sanitised and even the rat is powered by electricity. The laundry drying rooms would have been useful last winter. A footman flirts with a laundry maid — all rather twee! Our visit to Wilton House was to be curtailed by half an hour because of a concert that evening by the Bournemouth Symphony Orchestra, but their rehear­sal compensated us with strains of pastoral music. Though time was short, afternoon tea was essential before visiting the house. And with time in mind it was irritating to follow the one-way system around the house, without the freedom to deviate. Inigo Jones was commissioned to design Wilton House after fire had destroyed the first earl's house in 1647, but it was much altered during the early 19th century after designs by James Wyatt. Perhaps its most famous room is the Double Cube Room, spe­cially built to house the family's paintings by Van Dyke, with its fine ceiling. However, we preferred the simpler ceiling of the Colonnade Room with its monkeys, hoopoes and other birds in the treetops, set against the sky. Our thanks go to Sheila and Tessa for yet another successful outing. Many HADAS members have, over the years, benefited from the certificate and diploma courses in archaeology run by Birkbeck, and these can be approached at any level: as an introduction to the subject, to widen existing knowledge, or as a stepping stone to further studies. The subjects on offer include prehistory, Ancient Egypt, British field archaeology, Britain's industrial her­itage, medieval London, and much, much more. Course tutors include our new President, Harvey Sheldon, Paul Craddock of the British Museum, Hedley Swain of the Museum of London, and J. Scott McCracken. There are several venues which should be easily accessible for HADAS members, such as: the City Lit in Stukeley Street; the Museum of London; the Institute of Archaeology in Gordon Square; Barnet College in Wood Street; Highgate Library & Scientific Institution; and Barnet WEA in Queen Elizabeth Sports Centre. Tuesday September 4, 8pm Talk: Women in Roman Times, by John Brodrick. Old Fire Station, adj Town Hall, Friern Barnet Lane, N11. Visitors £2. Wednesday September 5, 8pm Talk: Working Conditions in the Old Potteries, by Robin Gurnett. Thursday September 6, 7.30pm Talk: Canals & Waterways on Film, by Amanda Huntley, with rare archive film. 12­13 New Wharf Road, King's Cross, Nl. Concessions £1.25. Sunday September 9 Open Day, music in The Bothy walled garden and other events. Wednesday September 12, 8pm Talk: People and Nicholls Farm, by Dr Gillian Gear. Wyburn Roan, Wesley Hall, Stapylton Road, Barnet. Visitors £1. Friday September 21, 7prn Talk: Recent AOC Archaeologi­cal Group Work in the City, by John Maloney. St Olave's Parish Hall, Mark Lane, EC3. Friday September 21, 8pm Talk: York Minster – England's Largest Stained Glass Museum, by Nigel Swift. Jubilee Hall, junct Parsonage Lane /Chaseside, Enfield. Friern Barnet & District Local History Society Sunday September 23, 2pm-4pm Conducted walk: High Road, Whetstone. For precise meeting point contact John Donovan, 01707 642886. Charge £1. Talk: Trading in the High Street, by Martyn Gerrard. Drawing Room, Avenue House, East End Road, N3. A rare chance to see inside many outstanding buildings not usually open to the public is offered by London Open House Weekend Saturday September 22, Sunday September 23. Those open (booking advised) range from private offices to livery companies' halls, from schools to cinemas. The list is available from London Open House, PO Box 25361, NW5 1GY, (£1.50 by cheque or in postage stamps, plus an addressed A5 size envelope with 41p stamp) or look at it in local libraries. On August 11, HADAS visited the Royal Gunpowder Mills at Waltham Abbey (report in the next Newsletter). The site (01992 767022) is open daily, 10am-6pm, until October 28, and the following special events are planned: September 8-9: Science weekend — The chance to experi­ence controlled demonstrations of mini explosions. September 15-16: 1940s re-enactment - Re-enactors take the royal Gunpowder Mills Back in time to the 1940s. September 29-30: Napoleonic training — the Napoleonic Association display their training techniques.